We host a number of monthly events and other initiatives (see below). Email us and follow us on Twitter to find out more or to get involved. At the beginning of each calendar year, the B68-PDA hosts a townhall meeting inviting all Building 68 postdocs to participate. During this meeting, the B68-PDA provides a summary of last year’s initiatives and activities, explains upcoming plans, and invites discussion and feedback. This meeting defines what initiatives will be taken and maintained by the B68-PDA throughout the year, as well as the topics that the B68-PDA will bring to the department for discussion. Every new Building 68 postdoc gets paired with a senior postdoc in the building to introduce them to MIT and connect them to postdocs outside their own labs. The buddies are encouraged to get coffee or lunch together one-on-one. In addition the B68-PDA hosts a larger “buddy lunch” for new and senior postdocs to network with one another. This monthly lunch series features postdoc alumni from industry, academia, and other fields who describe their job searches, current positions, and what it is like to no longer be a postdoc. This lunch is a good opportunity to learn about life post-MIT, and ask questions in an informal setting. We facilitate peer mentoring circles to help Building 68 postdocs build support networks, both during our time at MIT and as we move on to the next stage of our careers. These circles are small groups (roughly four to eight people), which meet twice a month to provide support, career help, and accountability to each other. All are welcome, even if you have just started your postdoc and are only just beginning to think about your career options. To find out more or sign up, just send us an email. The B68-PDA is in charge of inviting notable speakers to the Tuesday Biology Colloquia, and hosts these speakers during their visit to the department. This is an opportunity for postdocs to meet and interact with the invited guest during individual meetings, lunch, and dinner. Any postdoc in the department can suggest a speaker, and the choices are then voted on by all postdocs. 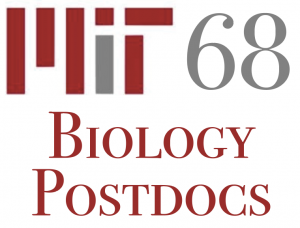 This monthly, internal MIT Biology lunch research seminar series features postdocs from Building 68, the Whitehead Institute, and Koch Institute. WIPS aims to enhance intellectual exchange between Biology postdocs, and encourage discussions about ongoing work, ideas, and challenges in a confidential setting. The B68-PDA hosts cookie hours and happy hours in Building 68 and at the Muddy Charles Pub to bring postdocs together to chat and connect. The B68-PDA also co-hosts the annual department Science Slam in September; any postdoc is eligible to participate in the competition or help coach participants.